We’re delighted to be sponsoring Greenwich Music Time, a new series of concerts being held in the historic Greenwich area of London. As this is the first Greenwich Music Time to be held, you might not be familiar with the event. So, we thought we’d give you the lowdown. What is Greenwich Music Time? Greenwich Music Time is a series of 4 concerts, held in the grounds of the Old Royal Naval College, which sits next to the River Thames. There are 4 headliners across the 4 nights (Wednesday 20th August – Saturday 23rd August): The Australian Pink Floyd Show, Goldfrapp, Russell Watson, and Jools Holland and his Rhythm and Blues Orchestra. Around 5000 guests are expected for each concert. Greenwich Music Time is being held at the Old Royal Naval College, which is located within the Maritime Greenwich World Heritage site. The Old Royal Naval College is the 11th most visited tourist attraction in the UK, with thousands of tourists flocking to see its famous twin-domed structure every year. The college was designed by Sir Christopher Wren and was built between 1698 and 1712. The building and grounds are run by the Old Royal Naval College Foundation, a charitable organisation that relies on government grants and events like Greenwich Music Time to preserve one of the UK’s finest historic buildings and grounds. 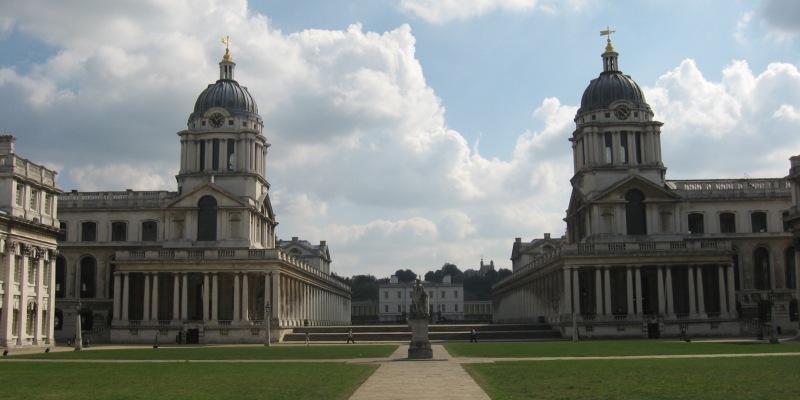 If you don’t recognise the Old Royal Naval College by name, you’ll definitely recognise it by appearance; it has featured in Pirates of the Caribbean: On Stranger Tides, The Dark Knight Rises, The King’s Speech, Skyfall and Thor: The Dark World. Greenwich Music Time will showcase some of the finest acts the UK has produced, spanning genres from electropop to classical. Admittedly, one of the acts comes from Australia, but they are the premier tribute act for one of the UK’s biggest and most beloved bands, Pink Floyd (guitarist David Gilmour even booked them for his 50th birthday party). The Australian Pink Floyd Show kick things off on Wednesday 20th August, bringing their mind-blowing stage show with them. Legendary electropop duo Goldfrapp will be performing hits new and old on Thursday 21st August, including tracks from their latest album Tales of Us. It’s their only London show of the year, so it promises to be a must-see for fans of the band. Russell Watson headlines the ‘Proms on the Thames’ on Friday night, where he is joined by the Royal Philharmonic Orchestra, X Factor finalist Rhydian and Kerry Ellis, and Jools Holland closes Greenwich Music Time with a bang on Saturday 23rd August, accompanied by his Rhythm and Blues Orchestra and some very special guest vocalists (including Melanie C and Marc Almond). What have people been saying about Greenwich Music Time? The event has already received praise from some very well-known faces, including the Mayor of London, Boris Johnson. “Greenwich Music Time will add to the unbeatable variety of great music events that London hosts throughout the year”, the Mayor said. “Amidst the historic surroundings of the Old Royal Naval College, it promises to be a summertime treat and will be another reason to visit this increasingly exciting part of the capital”. Where can I buy tickets for Greenwich Music Time? You can buy tickets from the Greenwich Music Time website. Prices vary for each event, but are very reasonable. ← [THIS COMPETITION IS NOW CLOSED] WIN tickets to Greenwich Music Time, one of London’s best music events!